Batman v Superman: Dawn of Justice is a 2016 American superhero film featuring the DC Comics characters Batman and Superman…. Batman v Superman: Dawn of Justice is a 2016 American superhero film featuring the DC Comics characters Batman and Superman. Directed by Zack Snyder and distributed by Warner Bros. Pictures, the film is a follow-up to 2013’s Man of Steel and is the second installment in the DC Extended Universe. Its screenplay was written by Chris Terrio and David S. Goyer, and the film stars Ben Affleck, Henry Cavill, Amy Adams, Jesse Eisenberg, Diane Lane, Laurence Fishburne, Jeremy Irons, Holly Hunter and Gal Gadot. 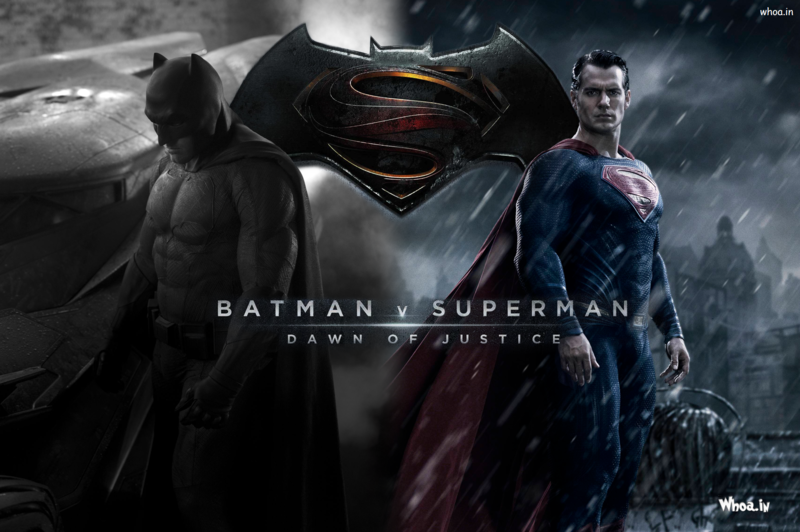 Batman v Superman: Dawn of Justice is the first live-action film to feature both Batman and Superman, as well as the first theatrical film to feature live-action portrayals of Wonder Woman, Aquaman, Cyborg and the Flash. In the film, criminal mastermind Lex Luthor manipulates Batman into a preemptive battle with Superman, whom Luthor is obsessed with defeating. Eighteen months after the destructive attack by General Zod in Metropolis from Man of Steel, Superman has become a controversial figure. Daily Planet journalist Clark Kent, Superman’s alter ego, has moved in with Lois Lane. Bruce Wayne, who has operated in Gotham City as the vigilante “Batman” for nearly two decades, sees Superman as a potential threat to humanity. After learning of Batman’s activities, Superman also views him as a threat, and seeks to stop him via the Daily Planet articles authored by him as Kent. Wayne learns that Russian weapon-trafficker Anatoli Knyazev has been contacting LexCorp’s mogul Lex Luthor. Meanwhile, Luthor tries to convince Senator June Finch to allow him to import Kryptonite retrieved from the Indian Ocean following the results of Zod’s terraforming attempt, claiming to use it as a “deterrent” against Kryptonians, but she denies the request. He also makes side dealings with Finch’s subordinate and demands access to Zod’s body and the Kryptonian scout ship. Wayne attends Luthor’s party at LexCorp, where he meets mysterious antiques dealer Diana Prince, and retrieves data from the company’s mainframe. The data drive, however, is stolen by Prince, who later returns it to Wayne after she is unable to decrypt the data. While decrypting the drive at the Batcave, Wayne has a dream of a post-apocalyptic world, where he leads a group of rebels against Superman. He is snapped out of the dream by an unidentified time traveler, who warns him of Lane’s crucial role in the distant future, and urges him to find “the others”. Wayne later realizes that Luthor is not only experimenting with Kryptonite, but also investigating metahumans. One of them is Prince herself, who is an immortal warrior. Wayne admits to Alfred Pennyworth that he plans to steal the Kryptonite to weaponize it, should it become necessary to fight Superman. Batman pursues a convoy carrying the Kryptonite to LexCorp, but Superman interferes and orders him to cease his activities. Comment me if you need downloading links. thanks for the information of his friend.